Following the recent spike of vulnerable road users killed in Toronto, which includes cyclists and pedestrians, a new study from U of T Engineering researchers found more than half of drivers fail to make necessary eye scans for pedestrians and cyclists when making right turns. “There are a lot of visual and mental demands on drivers at intersections, especially in a dense, urban environment like downtown Toronto,” said Nazli Kaya (MIE MASc candidate), who is leading the research under the supervision of Professor Birsen Donmez (MIE), Canada Research Chair in Human Factors and Transportation. “Drivers need to divide their attention in several directions, whether it’s other vehicles, pedestrians or road signs and traffic signals — traffic safety instantly becomes a major concern,” said Kaya. 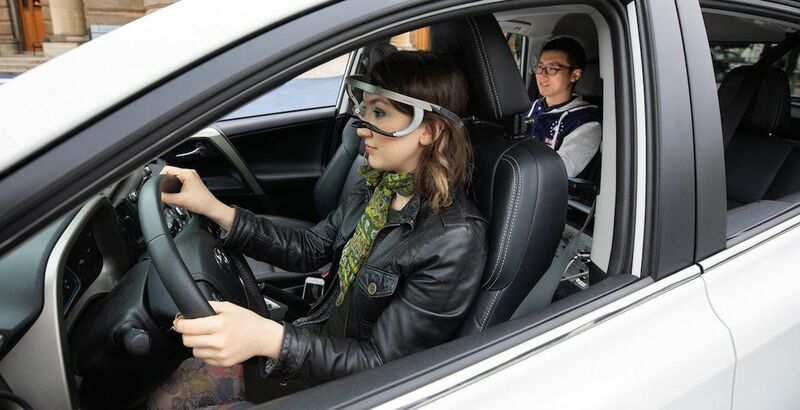 According to U of T, this is the first study to date to use eye-tracking equipment to accurately assess where drivers were looking when turning at an intersection. To complete the study, researchers assessed 19 drivers ranging in age from 35 to 44 who all had more than three years of driving experience. Drivers were required to make right turns at Palmerston Avenue from Bloor Street, a signalized four-way intersection, and at Major Street from Bloor Street, an uncontrolled T-intersection leading to a smaller road. Both locations required drivers to safely turn right across a dedicated cycling lane along Bloor Street. Researchers found that 11 of the 19 drivers failed to gaze at an area of importance, where cyclists or pedestrians would be located, before turning. These failures were related to the driver not making regular over-the-shoulder checks for cyclists. Major Street had the highest number of failures due to parked vehicles blocking the drivers’ views of the bike lanes. The study also revealed that attentional failures were more likely for the drivers who drove more frequently in downtown Toronto. Additionally, the study revealed that drivers less familiar with an area were more cautious when turning. Professor Donmez believes to improve traffic safety, changes to road infrastructure is needed and the inconsistency of bike lanes is one of the biggest hazards on city streets. “I think it’s an infrastructure issue. I don’t think it’s an education issue. When you look at the bike lanes in the city — they appear over here, but disappear there — the more unpredictable the road rules are, the more challenging it is,” said Donmez.